Anish Giri takes the only full point of the round. He beats Matlakov with Black to take sole lead. 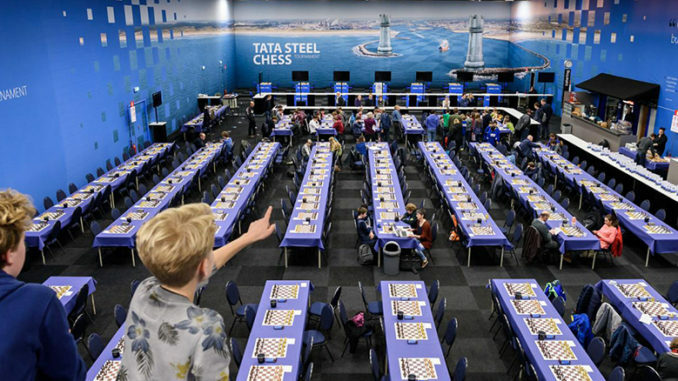 The Tata Steel Chess Tournament continued on Tuesday 23rd January, with round nine. There had been a rest day on Monday 22nd January, with Magnus Carlsen, Anish Giri and Shakhriyar Mamedyarov sharing the lead on 5.5/8. Play resumed under an interesting situation, namely that the players would be travelling by bus to Groningen later that evening, the second of two ‘Chess on Tour’ locations. This had me wondering just how much fight they would be feeling up for before their long journey to the north of the Netherlands. And this was proven somewhat valid as there were indeed some fairly quiet draws seen. Anish Giri was the only winner in the round, beating Maxim Matlakov with the Black pieces. This win, giving Giri sole lead of the tournament, will have gone down very well with the home crowd in the de Moriaan! Anish Giri faced Maxim Matlakov in round nine. Although he would be Black, it was my feeling that this should be a game that Anish should be looking to win. I do not mean any disrespect to Matlakov, he is a very strong player; however, he has not really shown his best in this, his first tournament at this level. And, objectively speaking, Giri is really a different class of player — it was just up to him to show it. And given the fact that his main competition, Magnus Carlsen and Shakhriyar Mamedyarov, were likely to have their work cut out for them claiming full points, (they faced Vishy Anand and Vladimir Kramnik respectively), he really should not be looking to merely hold with Black. The Reti was perhaps not the most ambitious of opening choices for Matlakov and Giri managed to equalise almost instantly. The crucial point in the game, arrived when the Queens came off on move 22 — shown in the diagram, below, with Black having played 22…Raxc8. The above position is about equal and the game proceeded 23.Na2 Nxe3 24.fxe3 c5 and it was here that Matlakov’s 25.Nd6 should perhaps have given way to 25.Rd1. Nd6 wasn’t bad exactly, but Rd1 seems more to the point, both supporting White’s pawn on d4 and removing any skewer possibility by means of …Ba3. It is possible that Matlakov decided against it because after 25…cxd4 he cannot recapture with exd4 because his Nc4 is hanging, but after 26.Nxb4 his position seems good. Upon 26…axb4 he has 27.Rxb4 and to 26…Rxc4 there is 27.Nc6. As it was, after his 25.Nd6 there came the very natural continuation of 25…Ba3 when White is committed to 26.Nxc8 Bxb2 27.Ne7+ Kf8 28.Nxg6+ hxg6 and here White has to decide what to do with his rook. Matlakov chose 29.Rc2 over 29.Rb1, most likely because after 29.Rb1 Rb8 it will be very hard to make anything of the b-file. He would take the tempo on the bishop and wait for Black’s …cxd4 when his pawns become undoubled and his rook is already on the opened c-file. This is what happened and the game reached the following position. Black has just played 34…Nb6 and here came the move that changed everything, 35.Rc1(?? Kf2 was probably necessary) Giri pounced with 35…Ba3 which puts the pressure on three White vulnerabilities, the rook, the bishop and the e3-pawn. First, the rook and White has two respectable options of where to move it, c2 and c3. Upon Rc2, Black has …Nd5, threatening …Nxe3 which forks King and rook. This move does something else, however, it cuts the white bishop off from the e4-square. Thus, after Kf2 or Ke2, Black simply plays …Kd6 and the bishop is doomed. Therefore, Matlakov chose 36.Rc3. However, from here, 36…Bb4(!) starts to turn the thumb screws. Rc2 would again leave …Nd5 and Rc1 would lose to …Bd2. The move that Matlakov opted for in this situation, 37.Nxb4(?) was even worse, however. After 37…axb4 38.Rc5 White lost quickly — 38…b3 39.a5 Nd7 0-1. The other games were drawn and out of these, it was Jones-Hou that was the most dramatic. I was curious to see how Gawain Jones would approach this round following his devastation in the previous round where he should have won against Magnus Carlsen, but lost. Unfortunately for Gawain, his game with Hou would not go far in putting any demons to rest. Infact, it was the second game in a row where Gawain failed to take a chance that his opponent had presented on a plate. The upside was, that after being significantly better, he didn’t end up losing. In the Catalan, the position reached the one shown in the diagram above, with Black having just played 10…Ba6. This is a position that has been seen many times, 11.Qd2 and 11.Bxc6 being the most common continuations. However, Gawain chose the more obscure 11.a3-a4 as his way of proceeding and I think this is a very good choice. Firstly, it has a very good score of 61% for White. Second, and perhaps most importantly, Hou is trying to find a balance between chess and her academic studies. And, judging by her performance so far in this tournament, (1.5/8), has not got it anywhere near right yet. Going down a lesser known route tests her preparation straight away. And this proved correct when she immediately erred with 11…Qc8(?). Both …Qe7 and …Qd6 had been seen here before, the latter seeming the most testing. Hou’s 11…Qc8 is vastly inferior and allows White to play powerfully with the very obvious 12.Ba3. With this, the less than ideal piece placement of Black’s rooks is very clear. There followed: 12…Rd8 13.Be7 Rd5 14.Bxf6 gxf6 15.Bxd5 cxd5 16.e4(!) with White having the better of the situation when it came to position and activity. This is much more telling than the material imbalance, the gaining of the rook has come at the cost of White’s light-squared bishop. From here, though, White’s advantage increased and it was starting to look like Jones would have good chances. However, just as he had in the Carlsen game, he seemed to tighten up a little to me. Some of his moves were rather slow and hesitant — 21.Qe3(? allowing …Qxa4) rather than 21.Qf5, for example and refusing 32.h4(! Black will always have to be mindful of this pawn and this will hamper her own activity) in favour of the rather wasteful 32.Qe2. All of this allowed Hou to improve her position. When Jones gave the rook back for Hou’s d5-bishop and a pawn, though he may well have been better, converting was not going to be a simple matter. In the diagram position, above, Hou has just played 36…Rh8-d8. For Jones, 37.Qb5 was necessary if he wanted to play with ambitions, but unfortunately for the Englishman, he went badly wrong with 37.Kf1(??) The logic of this move is very clear, White covers the g1-square and frees his d-pawn. As a further point, he may have been thinking about the possibility of activating his King via g2 and h3. Unfortunately though, this fades into complete ashes as it allowed his opponent right back into the game with 37…Qxd4! (37.Qb5 would have prevented this possibility (due to 38.Qb7+ followed by 39.Rd2, winning the Queen) and upon …exd4, White would have had Qxf5+ of course.) White’s advantage evaporated. And shortly afterwards, a feeling of déjà vu in the Jones camp would have been totally understandable, when it began to look like Hou might actually be better! The diagram position, above, shows just how the situation had changed and 43…Kg6(! stopping Qh6) rather than 43…c5 (? which allowed Qh6) may have seen White under more pressure. As it was, the game eventually saw the balance being restored and the players called it a day. What can one say about this game? Well, it is far beyond me to criticise Grandmasters, but both will no doubt be feeling very unhappy with this game. To be honest, any chess player would — and should. Gawain Jones should really have added two points to his total from the last two rounds, which would have put him just off the lead. To have only a half point to show for his efforts will be mortifying I am sure. In Hou Yifan’s case, she is getting herself into far too much trouble. Out of the rest of the draws, Caruana-Adhiban was the most tense, seeing a topsy-turvy game in the King’s Indian Defence. White was in control but Black had few problems. Then came Caruana’s 34.Nxc5 which opened the game up somewhat after 34…bxc4, when White had some considerations with regards to his d-pawn and Rd1. Luckily, Caruana solved things fine, perhaps aided by one or two second-best moves by Adhiban. In the end, only the Kings would survive the 60-move game. Any excitement in the build up to the game between Vishy Anand and Magnus Carlsen, was not really matched at the board. It saw a rather uneventful Ruy Lopez Breyer in which neither player really got up to anything. This conclusion did not surprise me very much to be honest. The other games were largely just as tame. All of this left Anish Giri in the lead of the group, half a point ahead of Magnus Carlsen and Shakhriyar Mamedyarov. Round 10 will be the second of two ‘Chess On Tour’ rounds and will be held in Groningen. This means that the round will begin at the later time of 14:00. Clash of the round must be Magnus Carlsen with White against Wesley So. And will Anish Giri go for it with White against Sergey Karjakin? We wait to see! The Challengers group, saw leaders Gujrathi Vidit and Anton Korobov draw their games. However, in the case of the latter, only just! Harika Dronavalli almost beat Anton Korobov, to take him from the top spot for the first time since the tournament started! The Indian Grandmaster completely got the better of her Ukranian opponent in the English Opening and will be quite disappointed to have let him escape, no doubt. Worrying times for Korobov in the closing stages of the tournament, perhaps. After dominating in the earlier rounds, he has begun to look a little vulnerable. All-in-all, there were four decisive games in the round and only one went to White.